As readers will have seen, we now have scaffolding towers known as crash-decks in three bays of the Library of Congress section under the skylights. 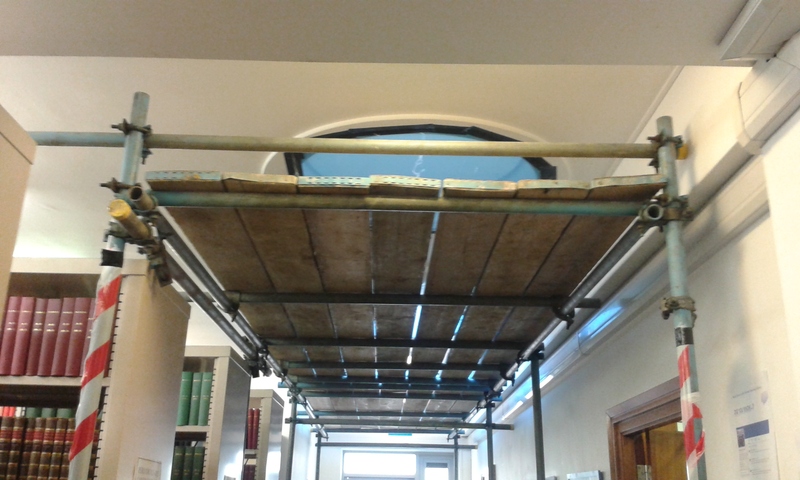 It appears – happily – that this should be the only disruption to this part of the library as the work to remove and replace the skylights will be taking place from above rather than in the building, so although we have had to remove the tables from those areas for the duration of the work the books are still safely accessible to readers. It has certainly afforded us an interesting view of the sky, which we would not usually have from this end of the library! We do not have an exact time-table for the end of the works, but are certainly glad to see some progress and grateful that the disruption to the inside of the library has been minimal. In the meantime please forgive the occasional loud bang or drilling noise! Kate has now completed her most recent book move, filling up the space at the end of the LC section which was cleared as part of the reclassification project over the last few months. We have updated the shelf-labels to reflect the changes. Readers seeking anything from the DS300s onwards are advised to move along a few shelves from where they would have expected to find things. The most significant change is that G is now under the windows on the Sackler side, so that has moved quite a long way. Natalija has been working on the G-section, applying a more detailed LC classification to the Arabic geography and travel-writing section, to reflect the different authors and subjects within it. We hope that readers of that subject will find it useful. The next scheduled maintenance on SOLO will be over the weekend of the 11th-15th August. From 5pm on Friday 11th August it will be possible to search the catalogue but users will not be able to request items, the Find & Request tab will not show and there will be no information available regarding the availability of particular items. It will not be possible to renew books or place stack requests during the downtime. Online access to electronic resources will not be affected. The maintenance period should finish by 9am on Monday 15th August; we will keep readers informed if it overruns. Note that the staff systems will also be out of commission over this period so we will not be able to order books or renew anything for readers, but we do have an offline circulation system which will mean that books may be borrowed. A quick reminder that we are closed at the end of August for the Bank Holiday weekend (27th-29th inclusive) and on the 5th and 6th September for St Giles’ Fair. We will post reminders nearer the time. This entry was posted in Building Works, Islamic Collection, Loans, News on 3 August 2016 by katieguest. As the end of the exams approaches and those readers who will not be returning are preparing to leave, we have been asked to remind those Finalists who are leaving us for good to please use up your PCAS credit! Your account will be rendered inactive after two years of non-use, but any credit which is still on it will not be refunded, so please do refrain from adding lots now if you are not going to need it! Credit *can* be transferred to another PCAS account, however, so if you have a friend who will still be here and are feeling generous, please contact pcas@bodleian.ox.ac.uk to arrange for a transfer (you will need all the details of both accounts to do this). We would also like to remind everyone to please return your books! It sounds obvious, but we have heard stories of parents finding library books in their offspring’s room months after said children have left for jobs on the other side of the world or otherwise moved away. It will be much easier for everyone if Finalists return their books before leaving Oxford. We can and will chase outstanding loans and fines, but would much prefer not to have to. We will start Vacation Loans in 8th week; books will be due back as usual on the Tuesday of 1st week of Michaelmas Term – 11th October. Readers whose cards expire before that date, and who are expecting to renew their readers’ card, will need to renew their books once they have a new card as the return date will have been set the day before their card expires. During the Summer Vacation we are going to be having our skylights replaced, which will cause some disruption to the library. 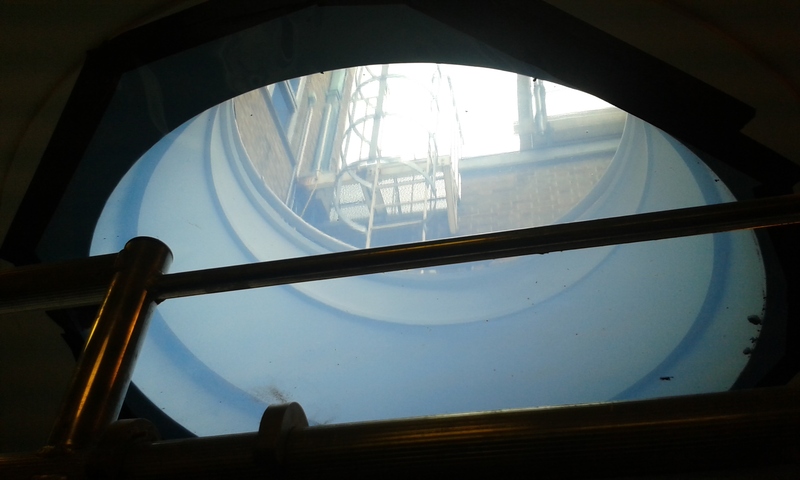 At present we have an imprecise timetable for the work – sometime during July or August is the best we can predict, but this may change – but we will keep the blog and Facebook page up to date with more information when we have it. The area around the skylights in the library itself will be sheeted off so that the books are covered in order to prevent damage. It will not be possible for readers to access them during this period, but staff should be able to fetch any books which are needed by readers, just ask at the desk! It is likely that there will be some noise and dust disruption during this time, but we are currently planning to remain open during the works. The skylights in the office will also be upgraded during this time; at present we don’t know what this will entail as our desks are actually under them, but with luck we will manage! As mentioned, we will update all our social media pages with more precise information when we have it. This entry was posted in Building Works, Loans, News, Vacations on 1 June 2016 by katieguest. The library has been gratifyingly busy during the past month, with various readers from departments other than the Oriental Institute borrowing books as their courses demand. We naturally expect things to quieten down slightly as the end of Term approaches. Readers of our Facebook page will have seen that Kate found someone’s lunchbox (still with the remnants of their lunch in) on a desk at the back of the library recently. We would like to remind everyone that food of any kind is *not* allowed in the library, and nor is any kind of drink other than water permitted. This is not because we are trying to be awkward or make the library less welcoming; it is simply because crumbs and bits of discarded food attract pests such as insects and rodents, which can damage library collections. Sugary drinks spilled on books can cause them to become unusable, while water damage is fairly easy (if sometimes a bit expensive) to fix. Please respect this rule of the library and confine your food consumption to the Common Room downstairs. We received a number of queries after a blanket email about outstanding fines was sent out last week. This is a new initiative by the Circulation Task Force of the Bodleian Libraries which is intended to ensure that fines are paid promptly; however the emails seem to have gone to people who are no longer regular users as well as the current borrowers they were intended for and have caused some worry for some of our former readers (one of those who enquired had graduated in 2006!). We will be offering feedback to the CTF about this matter. Vacation Loans started on Monday, 30th November, so any books checked out from now on will be due back on the 19th January, which is Tuesday of 1st week. Please remember to renew any books taken out before the vacation loans period began to take advantage of this if you wish to take your books away over the holidays. The library will close for the Christmas break on Tuesday 22nd December at 5pm and re-open on Monday 4th January at 9am. Please note that other Bodleian Libraries will be open on the 23rd; we are closing a day early because the rest of the faculty building is closing on the 22nd. Watch this space: the 2015 retrospective post is being compiled and will be added to the blog shortly after we return from the Christmas break. In the meantime we would like to wish all our readers a peaceful holiday and we’ll see you in the New Year! This entry was posted in Loans, News, Opening Hours, Services, Vacations on 3 December 2015 by .